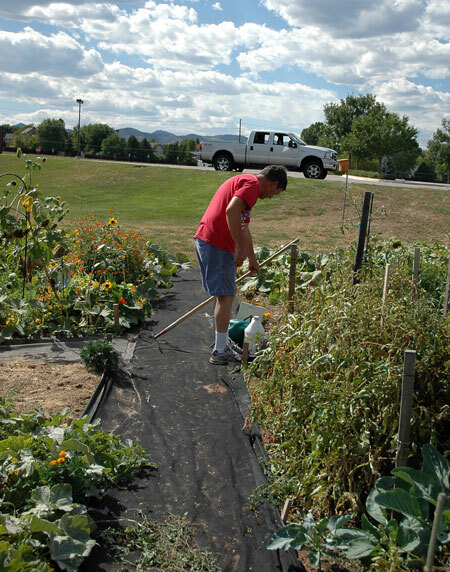 I’m a little late posting an update on our community garden progress for the month of August, but that is because we have been so busy trying to eat up and preserve the fruits of our labors! 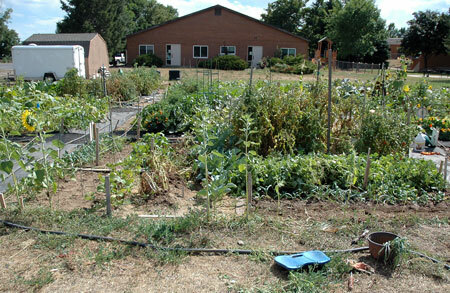 These photos were all taken on Labor Day, and you can see that there has been some harvesting going on. We pulled out the corn, which had started drying up; my dad harvested two full-sized ears of corn that were already starting to shrivel, but the rest of the corn was apparently eaten by mice, as we found several bare cobs still on the stalks. We also finally pulled out the shell peas, garbanzo beans, and black-eyed peas, and I dry-shelled the pods from the latter two; our lima beans, Rio Zapes, and purple hull peas are still flowering and producing small amounts of pods at a time. I finally had a chance on Labor Day to thin and transplant the half-row of leeks in our first plot. The biggest plants were the size of my ring finger, but many were still pretty small due to their cramped living conditions. 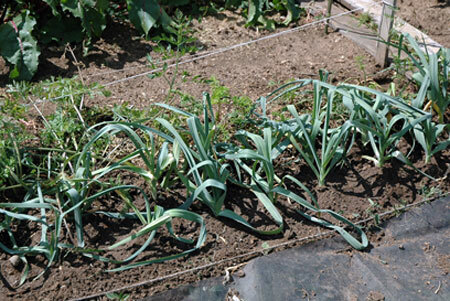 I ended up having enough to plant about 5 1/2 rows of nicely spaced leeks, divided between the community plot and our backyard garden. 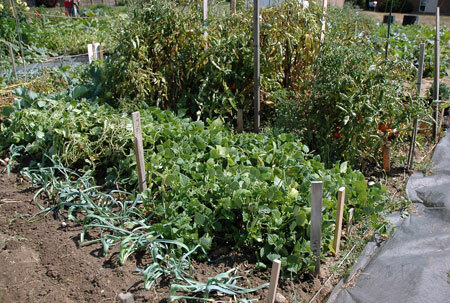 While we were at it, we also planted a few quick-growing, cold-hardy fall crops in the gaps in both plots: turnips, kohlrabi, and collards went into this bed. This angle shows a freshly planted row of collards, two new rows of leeks, our vigorously growing Rio Zape beans (which would have been much easier to harvest if we had decided to train them up on poles or trellises), and one of our two tomato jungles. 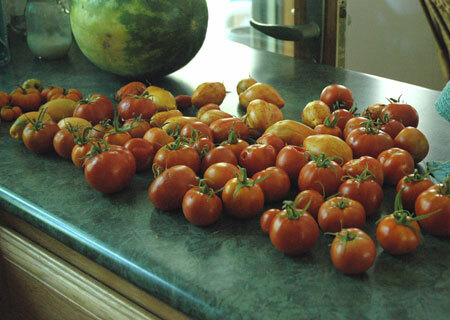 All the tomatoes at the garden are looking pretty dry and scraggly, not just ours, but we did notice that the heirloom varieties look particularly stressed, even as they continue to produce. 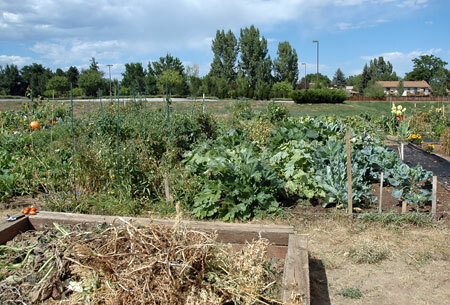 Here is our second community plot, with the second tomato jungle on the left, potatoes and squashes in the middle, and brassicas on the right. There was a very productive row of black-eyed peas on the far right by the aisle, with groups of 3 and 4 pods at the end of every stem, but it seems that this variety of cowpeas only gives one harvest and then dries up; I got a pound and a half of black-eyed peas to eat fresh and dry for later, and then we replanted the row with Tuscan kale. There is also a row of French breakfast radishes tucked in the middle of some of the transplanted brassicas that don’t seem to be growing very quickly. 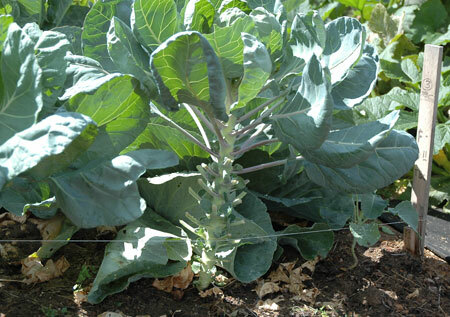 This is one of the Brussels sprouts that is doing great. You can see the little sprouts starting to form on the stem of the plant, which is why I have started cutting off the lower leaves. 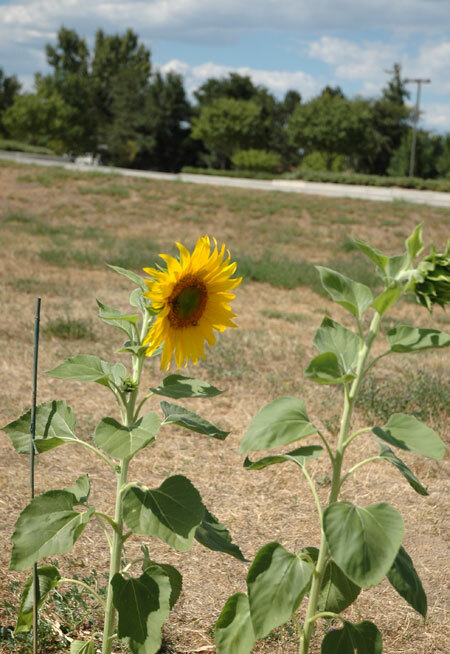 Apparently it encourages the plant to grow taller, thus producing more sprouts down the line. I have been sure to keep the large leaves, of course—they are very much like tender collards, and we found them delicious braised in chicken stock with fresh black-eyed peas. Our zucchini plants are still producing regularly, but you know what that looks like! 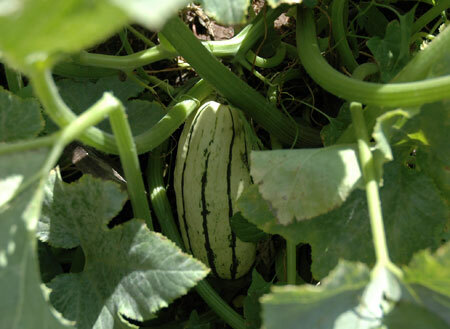 This photo shows one of our delicata squash plants instead. We are getting some big healthy specimens, and I have been eagerly testing them with my fingernail; once the skin is tough enough not to be broken, they will be ready to harvest and cure for storage in the next few months. This little guy could potentially go on our plates at Thanksgiving! 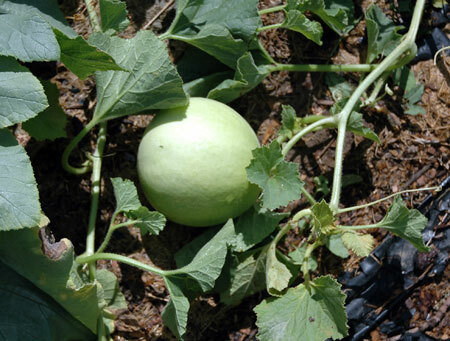 We also planted one hill of honeydew melons for fun, and there are now 3 or 4 softball-sized fruits developing on the vine. These plants seem to be big trailers, so there could well be more melons buried in among the zucchini and delicata that I haven’t seen yet. A photo of our most varied harvest yet, mid-August! 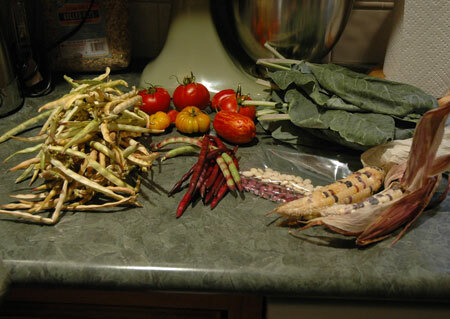 Clockwise from the center back: a variety of tomatoes, Brussels sprout greens, variegated corn, dried baby lima beans and Rio Zape beans, fresh purple hull peas and fresh black-eyed peas waiting to be shelled. 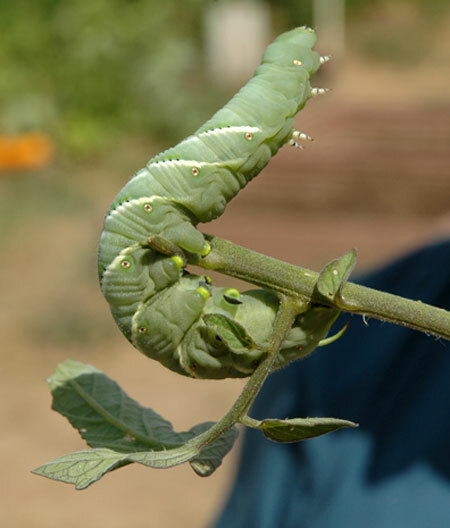 I also harvested this big guy from the tomato plants on Labor Day, a tomato hornworm. I edited my “ew” face from the photo, but it was definitely not a welcome sight, so I hope there aren’t many more hidden in there.